Architects are utilizing aluminum over steel for clear span applications because it is lightweight, corrosion resistant, extrudable into many custom forms, can be assembled and erected on difficult sites and is a sustainable material. Aluminum can also be designed for disassembly for future use in new projects. Lightweight aluminum structures can weigh anywhere from 35 percent to as much as 80 percent less than steel, yet provide equivalent strength. Because aluminum is extrudable, it can be designed to put the material only where it is structurally required. Custom extrusions are designed per project allowing the minimal use of the metal and reducing overall costs and raw material use. These extrusions greatly eliminate the fabrication required to create the structural shape. The overall reduced weight of the structure enables efficient assembly, reduced transportation and additional savings on construction. Although often considered a more expensive alternative to steel, in case after case, design professionals are finding that the costs are equal or less when specifying aluminum for major structural systems. Redundant secondary framing is unnecessary with efficient geometry creation as the structural shell system. This lightweight material can be shipped as components to be assembled on site without a crane. Aluminum structures are assembled with bolted connections and there is no welding required in the field. The connections are designed to accommodate the intersection of several members facilitating the ease of joining members together. Aluminum is also easy to shape, extrude and machine into many types of structural components. Aluminum extrusions are fabricated with dies that can increase the thickness of the members where they are needed and decrease it where it is not needed while maintaining structural integrity. “Putting the metal where it is needed is one of the great advantages of aluminum as a material. The efficient use of materials results in lower cost structures,” notes CST Cover’s Ferretti as she comments on the diverse uses of this twentieth-century structural product. Most window extrusions for commercial properties are made from aluminum. By using custom structural aluminum framing, adding skylights, windows, sun shading and solar panels are integral to the structure. Using aluminum eliminates dissimilar expansion and contraction rates of different materials. Complex shapes can be produced in one-piece extrusions without using mechanical fasteners. One-piece extrusions are less likely to fail, leak or loosen over time and are ideal for integrated system design. An additional savings to labor and materials is the ability of aluminum to be used with a mill finish. Aluminum naturally generates a protective oxide coating providing a finish that is durable, corrosion resistant and aesthetically pleasing. Using a mill finish can also expedite delivery. Other environmentally friendly finishes that are chosen for appearance can also be applied. Finishes vary from mill finish to highly polished finishes and include sandblasting, anodizing, specialty coatings, paints and powder coatings. The aluminum canopies over KAUST university walkways provide filtered light, encourages natural ventilation and adds to the cultural context of the designs. According to Ed Abboud, P.E., Director of Structural Engineering at HOK, in the past, the majority of spaceframes have been constructed of steel rather than aluminum. 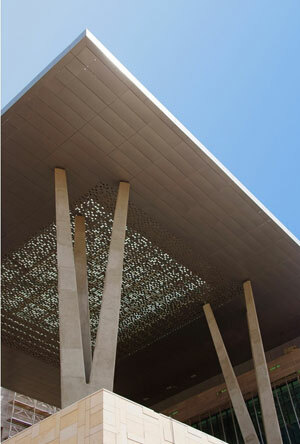 However, when HOK researched a solution for the main gathering space at The King Abdullah University of Science and Technology (KAUST) in Jeddah, Saudi Arabia, aluminum was the obvious choice for this unique long span spaceframe. HOK is a global architectural firm with an integrated approach to architecture. Their sustainable practice designs reflect their knowledge of technology and the use of natural systems to achieve results. One of their latest projects, one of eight in the past eleven years, to be awarded a “Top Ten Project” by the AIA Committee On The Environment (COTE) is King Abdullah University of Science and Technology (KAUST) in Thuwal, Saudi Arabia. To meet a very short design and construction budget, HOK engaged their eleven offices across three continents to complete this massive six and one-half million – square – foot campus in three years. Multiple HOK design teams worldwide worked in tandem to integrate sustainability into the design and construction of the world-class twenty-six building campus. Several hundred HOK people in eleven different offices on three continents contributed to the ambitious project, which was delivered within an unprecedented schedule — from conception to completion in just three years. Designed for a hot, desert climate and on the banks of the Jordan River, the HOK Planning Group began this project thinking about the environment with a “Racing the Sun” charrette. Planners from multiple offices and in many time zones contributed designs to a web server that were then incorporated into the final plans for the complex. They used environmental strategies from regional and traditional cultural designs as well as explored the translations of these concepts with the use of new technology and materials. These elements included the massing of the buildings in a compressed area to reduce building envelope exposure and increase shading for natural cooling of the walkways laid out like a traditional “souk” or marketplace. They conceived of a monumental canopy that would span across buildings to block the sun, facilitate natural ventilation and to filter light. This canopy would also be the platform for solar panels that provides power to the facilities. These long spans were exposed to the elements. The salt air of this site on the banks of the Red Sea, near Jeddah, created a highly corrosive environment for this structure. According to Ed Abboud, HOK’s Director of Structural Engineering, P.E. the commitment to a product begins with research. The client recommended a steel spaceframe for this large clear span structure; however, HOK was uncomfortable with the weight of steel and durability in this corrosive environment. The soft soil and fast track construction required them to find a lighter, less massive solution for the problem. According to Abboud, the team showed the client “galvanized steel air-handlers that showed signs of corrosion in nearby structures as an example of their concerns.” Convinced, the client travelled with them to investigate the possibilities of using aluminum as an alternative material instead of steel for these large spaceframes. The research team investigated numerous aluminum spaceframes across the world, ultimately selecting a company that would work with the designers to create the large spans with the least amount of materials. There is over 200,000 SF of aluminum spaceframe on this project. Typically, the depth of a standard spaceframe is normally seventy percent of the module size to create strut lengths of identical size in the upper diagonal and lower chords. For example a 10’ x 10’ module would have a depth of 7’. This project was limited to a depth of 3’ – 3” (1 meter) and a depth of forty percent of the module size, to keep the structures as shallow and lightweight as possible. Aluminum trusses were also used in some areas, spanning seventy-five feet between buildings. Site restrictions and the ability to get cranes between two buildings caused the team to choose trusses instead of spaceframes for some locations. The custom designed connectors or nodes of the spaceframe are variable but some are as large as 14” in diameter. In comparison, a standard node is usually 4.5” in diameter. The nodes were sheared off to provide a flat surface to accept the glass cladding system and to minimize the depth of the structure. The same detail for the nodes were used at the bottom of the frame to allow for the aluminum perforated panel system that let in filtered light to the walkways below. There are over 18,000 struts and 4,600 hubs on the job that were fabricated and shipped to the site in less than nine months. The structure was provided in a mill finish to expedite delivery and ultimately reduce overall costs. The project schedule on the aluminum structural elements for this project was less than nine months for the design, fabrication and shipping. 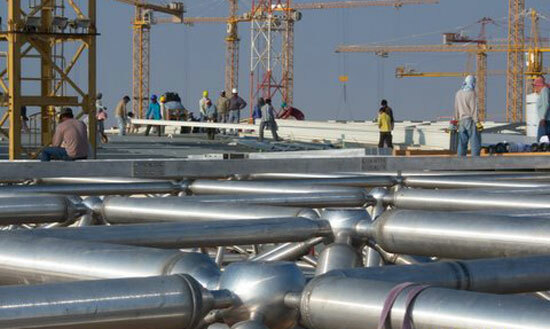 A view of the large flattened aluminum nodes of the spaceframe at KAUST. The frames were fabricated in Houston and shipped to Arabia where they were lifted into place after assembly on site. Strong, durable, lightweight aluminum was chosen for this main element at KAUST which is the largest Platinum LEED®-NC project in the world. Using a combination of passive solar strategies such as orientation, shading and natural ventilation with a high level of technological expertise, HOK was able to design a project that delivers a high level of environmental performance.2 These include in the areas of water (100 percent wastewater reuse, 42 percent water reduction), energy (27.1 percent annual energy cost savings, 7.8 percent on-site renewable energy, 80% of glazing shaded year-round) and materials (20 percent recycled content, 38 percent regional materials, 99 percent wood from Forest Stewardship Council sources, 80 percent construction waste management). These large aluminum canopies form the character of the campus. The roof vaults are an example of well researched integrated design strategy that encourages passive cooling and natural ventilation while reducing the heating and air-conditioning loads by the design of an environmentally responsible aluminum structure.